The Arkansas Department of Health has set up a special website dedicated to educate and register medical cannabis patients and caregivers. The process of registering is very similar to a patient and there are yearly fees payable to the Arkansas Department of Health. According to Arkansas state law and regulations, a medical cannabis patient is allowed to have a caregiver. In this role, the caregiver is allowed to enter a dispensary, possess, purchase and transfer medical cannabis from the dispensary to the patient. In some cases, the caregiver may need to assist the patient with product selection, dosing, journaling, and administering of medical cannabis. Becoming a licensed medical cannabis caregiver is an excellent opportunity for Arkansas nurses and home health care providers to integrate cannabis into a patients’ therapy. With proper training and education, patients and caregivers will be able to access lab-tested medical cannabis products that can be titrated and integrated into traditional therapies, such as chemotherapy. The Arkansas program already has pediatric patients registered and awaiting dispensaries to open. Parents and guardians of pediatric patients are required to become caregivers on their child’s behalf. Click here for a parent’s guide to understanding cannabis as a treatment for pediatric seizures, This free guide is offered by Dr. Dustin Sulak and is a must watch for any parent wanting to understand cannabis as a treatment for pediatric seizures. Learn more about becoming a caregiver and nursing considerations in Little Rock on March 11, 2018, at the ACIA Dispensary Agent Training. Click here to reserve your seat. 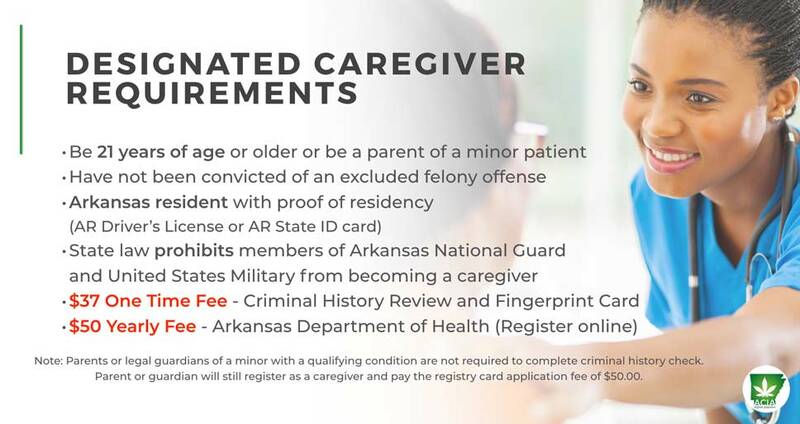 If you need to register as a caregiver, click here to complete the process with the Arkansas Department of Health.